If you feel left out and lonely, you need to find friends. Perhaps forming friendships has always been hard for you, or maybe you've recently moved and don't know anyone. Whatever the reason, remember that at some point, everyone has to make new friends. If you are a teenager struggling to form fresh relationships you need a few ideas to get things moving. It sounds obvious, but the first step to making friends is to appear welcoming. No one will want to meet up with you if you look sullen, aggressive or standoffish. Making a move towards a friendship can be daunting, but take a deep breath and have a go. Smiling shows others how pleasant you are. Even when you are nervous and faced with a new situation a smile lets people know you are approachable. If you smile someone will smile back; smiling is contagious! Smiling is a reflex action you learn as a baby. 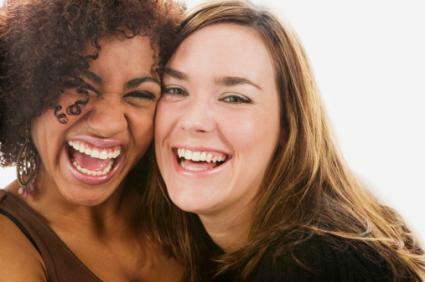 Psychologists report that when people smile not only does their mood improve, but others feel better too. That's a good way to start a friendship. Few people will ignore you if you say hello, but be careful to choose the right situation. Don't greet someone as she's rushing to class late, or in the middle of an exciting conversation on a Monday morning. Pick your moment. Speak to the person beside you in homeroom or beside a bulletin board. When you're searching for a table in the cafeteria, ask to join a group as opposed to asking if you can sit there. There is a difference. Start a conversation by asking for help. Ask directions and you may get shown the way. Enquire when a homework project needs to be submitted, (even when you know the answer), and you could get a companion to work with. You'd be surprised how happily people respond to the opportunity to help. During homeroom, exchange names and talk about the day ahead. At the bulletin board, point to a notice and ask what your companion knows about it. When getting directions, tell the person why you are going there. Even talking about the food in the school lunchroom will always get a big reaction. Just be natural, take it slowly, and don't be pushy. Make acquaintances first, then friends. At school, get involved in extracurricular activities. Join something you are genuinely interested in. That way your companions will share your interest and enthusiasm. Group sports or gym classes improve your fitness level and mood. Don't worry if you've never been the athletic type; you don't need to be an Olympic athlete. Attempt something completely new, like art classes, writing a column for the school newspaper, joining the choir, or auditioning for the drama production. If you're not a natural performer, there's always plenty of work backstage, as an usher, or similar type job. If you don't see anything of interest, think about starting a club. Consult a teacher or counselor about your ideas. A notice on the school bulletin board might connect you to others who will jump at the chance to join in. Sitting at home worrying about your lack of friends won't solve anything. People won't come to you, so you must go out and find them. Look at bulletin boards, newspapers, or ask your teachers what is happening locally. They'll be pleased to advise you on community activities. There are many opportunities for teenagers who wish to work in the community and a multitude of ways to get involved. When you work towards a mutual goal, you form lasting bonds with your teammates. Speak to your parents about your plans. If you get a part-time job or take part in a community project, they need to know what you're doing, where, and when. They may also involve themselves in community projects and extend their own circle of friends. Online sources will provide you with tips on getting involved. For example, the Corporation for National & Community Service has useful information about the personal benefits gained through community work, and how to volunteer for local projects. At VolunteerMatch.org, it's easy to search for care projects, events and activities for which you can volunteer. The number of volunteers for each activity is listed, and each of those volunteers is a potential friend. Shyness can indicate that you are subject to insecurities and fears about yourself and how others will react to you. You may worry about making a social blunder, appearing boring and lacking in ideas, or that people will snub you leaving you standing there alone. Fear of rejection by a group often prevents people from making that first move towards friendship. Examine these emotions and try to come to terms with them. Keep these tips in mind to keep shyness from ruining your chance at making friends. On approaching a conversation, don't join in with witty remarks. An attentive listener is always appreciated. Everyone makes a gaffe sometimes. If that happens to you, just smile, apologize or make a joke about it. Remember, chances are no one noticed. Don't be concerned that others are judging you; most people are more interested in the image they are projecting to criticize your behavior. Try to change your self-image by remembering your positive attributes. If you have an acquaintance going to the same event, arrange to travel together. Arrive at a party or meeting early; be there when other first arrivals dribble in, so you meet people one by one as they arrive. Ask to help out; you'll feel better if you're busy. Have an escape planned in case it all gets too much for you; say you may have to leave early but you'll stay as long as you're able. Try to link up with others who are also quiet. Introduce yourself to newcomers. Putting others at ease will do them a favor and you'll feel better about yourself too. Don't join a group just because it seems popular. Look for people you identify with. You may feel friendless and despondent, but you are not alone. Many people are in the same state of mind. Read books that give an insight on how others cope. Try talking to older siblings or cousins you are close to; they may have tips to help you through this period and even introduce you to their own friends. Above all, remember that you cannot make friends if you don't try.